By 1936, Yasujiro Ozu had directed 30 silent films. The Only Son (1936) was his first talkie – a business move on the part of the studio that had wanted the director to stop making silent films for years. Ozu created friction with the studio when he refused to use their sound technology and opted for one invented by his regular cameraman Mohara Hideo. Set in Central Japan circa 1923, widowed Otsune (Iida) works hard in a silk mill. She tells her son Ryosuke (Hayama) that he cannot go to an expensive school. However, his teacher, Okubo, stops by to congratulate Otsune on agreeing to pay Ryosuke’s way through high school and college, much to her chagrin. At one point, she tells her child to “study hard and become a great man” and make his late father happy. Otsune is willing to work her fingers to the bone in order to pay for Ryosuke’s education so that he can make something of himself. The film jumps to 1936 and examines the mother-son relationship between these two people. Ryosuke has grown up and found a job in Tokyo. She goes to visit him and finds out, much to her surprise, that he’s married and has a son. The rest of the film plays out her disillusionment with how her son has turned out. Ozu’s humanistic streak is apparent in the scenes between mother and son. There is a strong bond between them even though they don’t always communicate. The Only Son is a fascinating look at Japanese culture in the 1930s. Made between his two stints in the Japanese army, There Was a Father (1942) explores the bond between a father and his son, reflecting Ozu’s feelings on national unity at the time. In this film, the nation’s interests always come before oneself. The film was written soon after The Only Son was released and could have been Ozu’s next film had he not been drafted. The version of There Was a Father that was eventually made came from a heavily revised script. Shuhei Horikawa (Ryu) is a mathematics teacher that takes his students on a class trip. However, one of his students dies in a boating accident. Understandably upset, Horikawa blames himself and resigns. He decides to spend more time with his son Ryohei (Tsugawa). They move to the country and the father finds work at a temple in a small village. He and his son bond over chores and fishing trips. There’s a warmth between father and son and we see how much Horikawa cares for his child. He is willing to work hard enough to support Ryohei through school provided the boy studies hard. There Was a Father is the flipside to The Only Son in that there is a dutiful son in the former while the latter features an estranged child. Both films also examine the differences between rural life and urban living. The Only Son features an interview with film scholars David Bordwell and Kristin Thompson. He says that Ozu is the greatest filmmaker of all time and sings his praises. He sees The Only Son as a somber film with the humour being marginalized. He and Thompson talk about how the film comments on Japanese society. Japanese film critic and scholar Tadao Sato is interviewed. He talks about how the film’s story was a very common one in Japan at the time. He provides historical background to the film and what the culture was like. There Was a Father features an interview with Bordwell and Thompson. He says that the film balances cinematic values with a political message. He and Thompson put the film into a historical context. 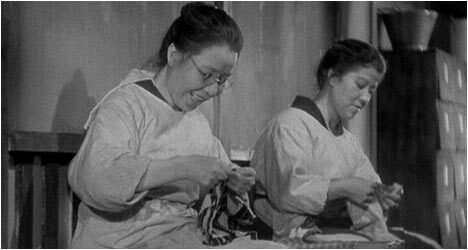 She mentions that even though the film was liked by the Japanese government and viewed as propaganda for World War II, Ozu played down the militaristic aspects.